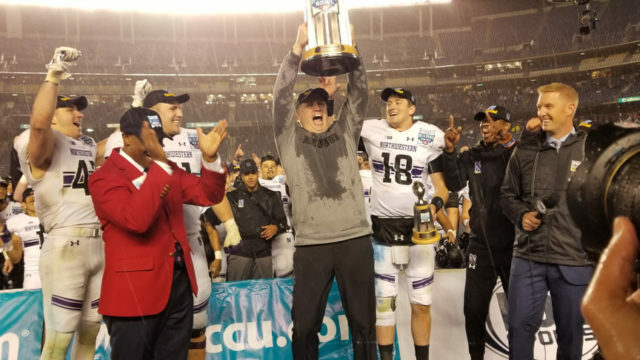 Northwestern turned three third-quarter turnovers into touchdowns to overcome a 17-point halftime deficit to defeat Utah, 31-20, in the 41st Holiday Bowl on Monday evening at San Diego County Credit Union Stadium. Wildcats quarterback Clayton Thorson threw both of his touchdown passes in the third quarter and was selected as the offensive MVP. His 241 passing yards gave him the career Northwestern record, breaking the previous mark of 10,580 held by Brett Basanez set from 2002-05. Wildcats sophomore safety JR Pace was the defensive MVP for making an interception, recovering a fumble and making seven tackles before a crowd announced at 47,007. Northwestern trailed 20-3 at halftime and scored 28 unanswered points in 11 minutes, 33 seconds to win their third consecutive bowl game, a first for the program. The 28 points were the most in any quarter in Holiday Bowl history. The comeback began with Thorson’s 4-yard touchdown pass to Riley Lees, one pay after Thorson’s 52-yard pass to Ramaud Chiaokhiao-Bowman and two plays after linebacker Blake Gallagher intercepted a pass by Jason Shelley at the Wildcats 44-yard line. After an exchange of punts, the Utes drove to Northwestern’s 6-yard line. Shelley was sacked at the 14-yard line by Joe Gaziano, who stripped the ball from him. Safety Jared McGee recovered the ball at the 18-yard line and ran 82 yards for a touchdown. Northwestern (9-5) took the lead for good with 4:39 left in the third quarter on Thorson’s 20-yard pass to 6-foot-4-inch, 296-pound “superback” Trey Klock, the senior’s first catch and first touchdown. The touchdown came two plays after cornerback Trae Williams forced receiver Jaylen Dixon to fumble, which was recovered by Pace at the Wildcats 35- yard line and returned 34 yards to Utah’s 31-yard line. Lees ran eight yards for the final touchdown with 1:40 left in the third quarter, one play after a 15-yard pass interference penalty. The six- play, 67-yard drive began with a 23-yard rush by Isaiah Bowser. Thorson completed 21 of 30 passes with one interception. He was sacked twice. Jason Shelley threw 27- and 4-yard touchdown passes to Jaylen Dixon and Jake Jackson in the first quarter for Utah (9-5). Charlie Kuhbander kicked a 21-yard field goal 8:42 before halftime for the Wildcats only first-half points. Matt Gay increased the Utes lead to 20-3 with a 32-yard field goal with 3:57 left in first half and a 20-yard field goal with five seconds remaining in the half. Shelley completed 27 of 45 passes for 302 yards with two interceptions. He was sacked twice. Utah outgained Northwestern, 393-322 and led 19-17 in first downs. The Wildcats led 31:51-28:09 in time of possession. The loss dropped Utes coach Kyle Whittingham’s bowl record to 11-2. The Holiday Bowl was played on New Year’s Eve for the first time. The decision to play the game on New Year’s Eve was made by the Football Bowl Association, Holiday Bowl officials and Fox Sports, which is televising the 4 p.m. game, Rick Schloss, the Holiday Bowl’s director of media relations, told City News Service. After being played before Christmas for each of its first eight games, the Holiday Bowl was played between Dec. 27 and 30 each year between 1986 and 2017. Dec. 30 has been the date the game has been played on the most times, 16, most recently in 2015. The Dec. 30 date would have been impractical this year because it would have meant the game would have to compete for television viewers with a full schedule of NFL contests. No bowl games were played on Sunday during the 2018-19 bowl season.